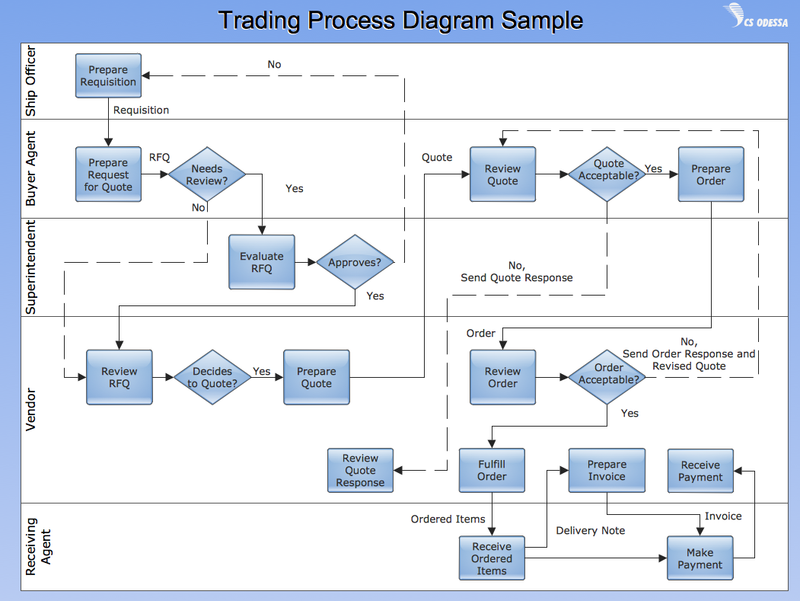 Cross-Functional Flow Chart sample: Trading Process Diagram. This example created with ConceptDraw DIAGRAM - Drawing Software for Vertical Cross Functional Flowchart. The question how to create a column chart have a simple answer. Use ConceptDraw tips to find out how to create a column chart depicts your data the best way. ConceptDraw DIAGRAM v12 is a powerful software that helps you create professional looking cross-functional flowcharts with the well-designed objects. ConceptDraw DIAGRAM v12 allows you to focus on work, not the drawing process. ConceptDraw Arrows10 Technology allows to draw connectors with smart behavior that gives flexibility to you during work process. Use ConceptDraw DIAGRAM v12 enhanced with solutions from ConceptDraw Solution Park to create diagrams to present and explain structures, process flows, logical relationships and networks. For those who want to know what is a cross functional flowchart and how to draw it, we preared a special library and professional looking templates. Take all the advantage of your drawing software to learn and create such a well-designed flowcharts. Watch the HowTo video to learn more. Picture: What is a Cross Functional Flow Chart?